Despite heat and humidity Saturday and intermittent storms Sunday, attendance at the Northfield Garden Tour was high this past weekend. I managed to visit four of the six gardens on the tour and came away with three great ideas for my own gardens. Vegetables and flowers blend well in this formal garden. Mixing vegetables and flowers. Vegetables can be attractive, so why stick the vegetable garden in the back of the yard? Most of the gardens I visited had vegetable beds that were part of the main garden or the gardeners used flowers to enhance their vegetable gardens. (Worth noting: all four of the gardens I toured had vegetables as well as ornamental plants.) 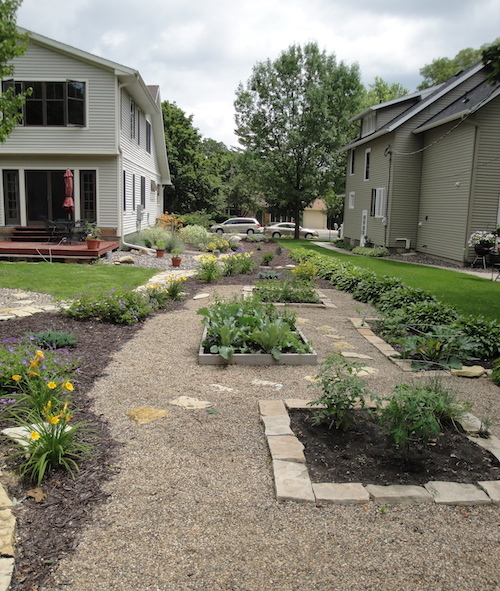 This garden-in-progress used raised beds for vegetables in an area with mostly ornamental plants. Structure, structure, structure. Like the adage about real estate (location, location, location), inviting gardens must have structure. 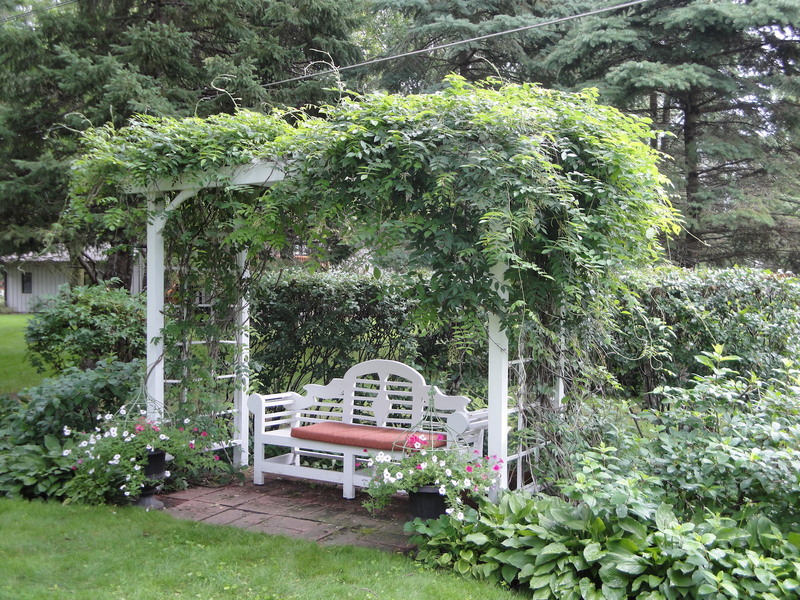 Whether provided by fencing, rocks, stone walkways, or charming wood structures, such as this seat with an arbor covered with wisteria, structure gives the eye a place to rest and enhances the plantings around it. All of the gardens had artists in them and several of the artists created pieces in ceramic or iron that would provide another focal point in a garden. Something structural in the garden gives the eye a place to rest — and the gardener, too. 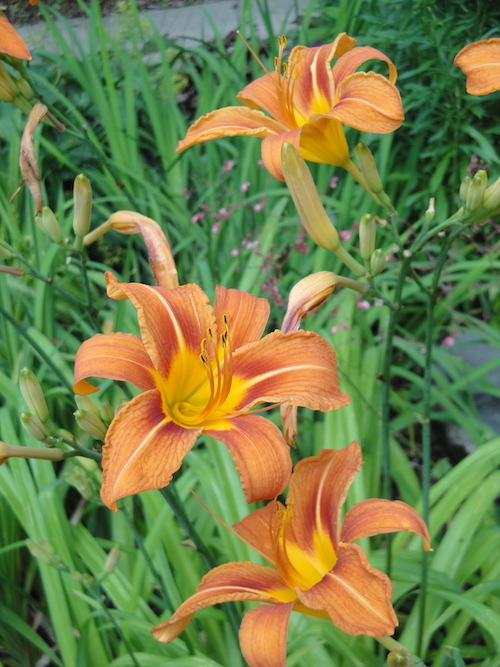 Orange daylilies brighten every garden. The power of orange. Ever since I heard Eric Johnson’s discussion of orange at the Northfield Public Library this spring, I’ve been contemplating orange and its effect in the garden. Every garden I visited Sunday had orange flowers somewhere and the orange brightened up everything around it. I have some orange nasturtiums I am growing this year and now that they have started to bloom, I can see how attractive and lively orange is in a container garden. One of the best things about garden tours is talking with the gardeners and getting new ideas. I have several more tours I’m scheduled to take in July, and I expect to learn something new from each of them. Lovely arbor. That is one thing I am in need of in my front garden. I have flirted with the idea of more veggies in the front perennial garden. Right now I have a few Alpine Strawberry bushes, but that’s it. I think I may look at the idea more closely for next spring. I love open gardens/garden tours: I get so many ideas for my own garden from them. That arbor is fantastic! Planting vegetable plants in a flower garden is a great idea.